Pursuing a New York theater degree with a minor in pop culture. 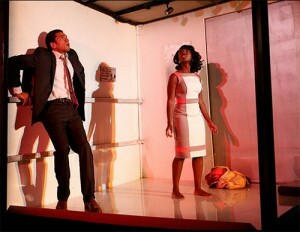 PlayCo is currently staging one of the most innovative pieces of theater I’ve ever seen, Ludic Proxy. I highly recommend seeing the show, as well as reading this illuminating interview with its creator Aya Ogawa, who dared blend video games and theater. Read the article over at TDF Stages! Which Spirit Is Moving Her, Exactly? Over at TDF Stages I wrote about Little Children Dream of God, an enchanting, funny, and voodoo-infused new drama from Jeff Augustin. I was lucky enough to chat with Augustin and director Giovanna Sardelli about how they evoked Haitian magic in Roundabout’s underground black box theater. See the show! Some demons are imaginary and some of them are real, and during a climactic moment in Little Children Dream of God, they all engulf the stage. Jeff Augustin’s play, now in Roundabout’s Underground series, follows a Haitian immigrant named Sula, who has floated to Miami on a car tire in search of a better life. Eventually, though, her past catches up with her, which leads to an explosion of voodoo power: Frantic drums tear through the speakers; dazzling light fills the tiny black box stage; and actress Carra Patterson stamps her feet and waves her hands, controlled by something guttural and fierce. ‘Tis the season for gift giving! Not sure what to get your theater geek cousin? Your therapist? That boy you’ve been sort of seeing who says he likes your smile but refuses to have a “check-in” conversation and now you’re just sort of wading through a gray area relationship-wise? Fear no more! Over at TDF Stages, I wrote up a list of 12 theater-related books for the 12 days of Christmas/the postmodern holiday pastiche we’ve been lazily referring to as “Christmas.” It also doubles as my wish list. FYI. Happy Holidays! Check out my TDF Stages article on Lift, a full-length play over at 59E59 that takes place entirely in an elevator! You might even feel uplifted reading it!! This is a big one, folks. It is straight-up miraculous I’ve never used this blog to broadcast my bizarrely intense obsession with The Color Purple. I recently got to write “Fanmail” over at TDF Stages about LaChanze, the actress who solidified that obsession into a crucial cornerstone of my teenage years. Check it out! As a small white boy from Honolulu, I always had difficulty explaining my obsession with The Color Purple. I suppose it started with Alice Walker’s graceful writing in the book, and intensified when I watched Whoopi Goldberg’s and Oprah Winfrey’s powerful performances in the movie. But my fervor truly ignited when, on a rare trip to New York City, I saw the Broadway musical The Color Purple with my father and grandfather. 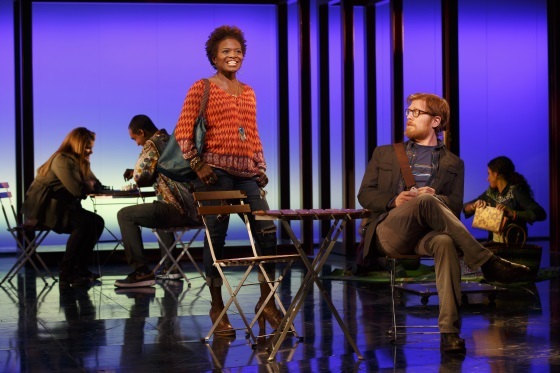 And it was LaChanze, lighting up the stage in her Tony Award-winning role as the downtrodden Celie, who captivated my 16-year-old soul completely. Who’s In Charge of the Giant Bubble? 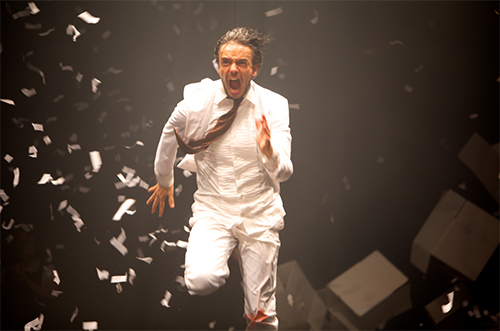 Check out my TDF Stages article on Fuerza Bruta WAYRA, and then go check out that wild, immersive and dazzling show! For performance art junkies and thrill-seekers alike, Fuerza Bruta WAYRA offers a breathtaking array of multi-sensory spectacles not found in an ordinary theatre. From the high-flying performers to the epic, Argentinian-influenced music—not to mention the massive, two-sided climbing wall and the pool of water hovering above the audience’s heads—this operation begs the question: who on Earth is running the show? “Everyone is in communication with each other from the very start,” says stage manager Roumel Reaux, who also managed Fuerza Bruta‘s previous Off-Broadway incarnation. “The lighting engineer, sound engineer, automation, the riggers, the carpenters: every crew member is in touch.” So while WAYRA features an impressive cast of aerial singers and dancers, Reaux’s eighteen crew members are also stars in their own right. What are your favorite “guilty pleasure” shows? Here’s a crazy idea. What if theater journalists wrote about shows the same way TV recappers chat, or the way friends talk about their favorite art? TDF Stages is launching what I believe to be an innovative approach to theater writing, with more informal, buzzy coverage and an attitude of unabashed enthusiasm. Check out the latest installment of the new Geek Out/Freak Out, in which I geek out about “guilty pleasures” with none other than Nate Silver, up-and-coming director extraordinaire. Don’t be afraid to share the article, and join the fun! Welcome to Geek Out/Freak Out, where theatre fans get super enthusiastic about things. This week, Stages contributor Jack Smart geeks out (via Google doc) with Nate Silver, Managing Director of Chicago’s Jackalope Theatre and assistant director of the upcoming Broadway production of Disgraced, which previously played at Lincoln Center. Today’s Topic: What are your favorite “guilty pleasure” shows… and what constitutes a “guilty pleasure” anyway? Jack Smart: Well hello there, Nate. You and I have managed to see a lot of theatre together despite the fact that I’m in New York and you live in Chicago. I feel like we tend to see the kind of theatre some audience members might have a hard time publicly admitting they like. I think everyone has their tastes and preferences, but some shows are generally deemed “classy,” while others must be enjoyed secretly. What do you think? How low under the bar of lowbrow culture are we “allowed” to limbo? Is there something shameful about sitting gleefully among dozens of tweens in princess dresses at the very first preview of Cinderella? That was us, after all. Nate Silver: For me, going to the theatre means different things at different times—to satisfy different cravings for different moods. In the same way that I am equally engaged by Mad Men and Modern Family, there’s a place for both Bring It On: The Musical and Who’s Afraid of Virginia Woolf?. Sure, there’s the idea of hate-watching (see Smash), but I inherently trust the theatre more than television. If something makes it all the way to Broadway—if it has financial backers, critical interest, a top-notch production team, actors at the top of their game—I’m going to see it.Bring It On was a surprise high point for me. I’ve never seen that brand of athleticism onstage. I had a similar experience at Rocky: I’ve never seen a set move in the way that one did. Was I truly moved by either of those musicals? No, not really. Was I actually, legitimately, not faking it, shamelessly entertained? You bet. Sometimes that’s all I’m looking for.